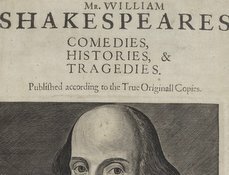 Dated October 7, 1601, this is the first of five enrolled indentures of bargain and sale for the Globe site, naming William Shakespeare as a leasee. The Globe playhouse was first built in 1599 on land leased from Sir Nicholas Brend. 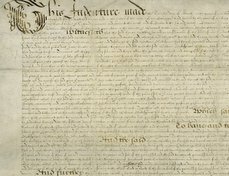 Though the lease of February 19, 1599 has not survived, it is referenced in nearly a dozen legal documents, including the five indentures: two from 1601 (October 7 and October 10) and one each from 1608, 1622, and 1624. Though the originals are lost, their full texts are enrolled in the C 54 series of Close Rolls now held at The National Archives. This first indenture focuses on the site of the “playhouse” on Maid Lane, Southwark. Here, the various properties in Maid Lane, Southwark, are sold by Sir Nicholas Brend to Matthewe Browne, John Collett, and John Bodley. Browne and Collett agree to assume £1480 of Sir Nicholas’s debts (listed in a schedule), and to pay Sir Nicholas £250 in cash. 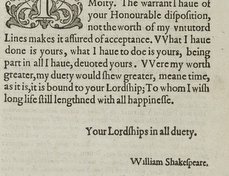 This is the first document in the series to name Richard Burbage along with Shakespeare as a leasee of the playhouse in Maid Lane. This indenture also names other tenants of the Brend properties on Bankside, revealing that the Globe site was one of many leased sites along Maid Lane. From this source it is possible to reconstruct the “neighborhood” of the Globe. 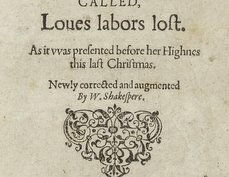 To learn more, read Alan H. Nelson's essay on the 1599 lease of the Globe playhouse site. Deed of transfer of the Globe and other properties from John Collett to Sir Thomas Bodley, listing William Shakespeare.